On February 14, 2012 at 9:00, four drifting buoys were deployed by PNAT close to the Costa Concordia accident to test the operational aspects of the buoys and their ability to supply real position in case of oil spill accident, and also to certify the prediction skill of a numerical model realized by CIMA/Ualg. The oil spillage mathematical previsional model, developed in ARGOMARINE Project, is running for the Costa Concordia accident. ERZ TV, Potuguese Tv network, presents the project and the mathematical model. During Costa Concordia emergency, ARGOMARINE run the mathematical model developed by the Algarve University in order to create a simulation of ah hypothetical oilspill. Michele Cocco (National Park of Tuscan Archipelago) and Ovidio Salvetti (CNR – Pisa) interviewed by Telegranducato TV. 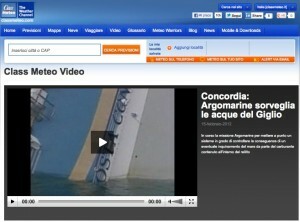 The ARGOMARINE technologies are one of the main topic of Leonardo program, a Rai 3 TV Scientific Program. The University of Algarve (Joao Janeiro and Flavio Martins) presents at the Portuguese TV RTP1 the mathematical oil spillage previsional model. On January 17th, 2011, a fishing boat sunk close to Faro (Algarve) – Portugal. The CIMA (Centro de Investigação Marinha e Ambiental)-Universidade do Algarve has simulated the effect of a possible oil spillage in consequence of the accident by using the ARGOMARINE’s oil slick fate modeling tools. Mary Mavropoulou (Marine National Park of Zakynthos) makes a complete overview af the ARGOMARINE Project at E.P.Z. Tv channel. The Workshop “Marine Pollution: Monitoring Systems and Treatment” held in the framework of NMPZ participation (as one of the Scientific Partners) in the FP7 – European Union funded Project: ARGOMARINE “Automatic Oil-Spill Recognition and Geopositioning integrated in a Marine Monitoring Network” which aims to develop an Integrated System for Marine Traffic Monitoring and Marine Pollution Early Warning, particularly for environmental- sensitive sea areas.